Iridescent paper adds a brilliant dazzle to any paper craft or origami project. This opalescent light blue paper shows a variety of colors at different angles. Iridescent Papers provide an explosion of colors. Cool blue hues sparkle from this fun, inexpensive paper that changes color with the direction of the light. The textures and colors will make any paper craft project jump off the page. Available in 10 exciting colors: Cotton Candy, Festive Green, Gold Rush, Hot Pink, Ice Blue, Lemon Lime, Melon, Orange Peel, Purple Haze and Teal Appeal. Available in two sizes: 8.5" x 11" and 19" x 27"
*Image used with permission from Kaz. 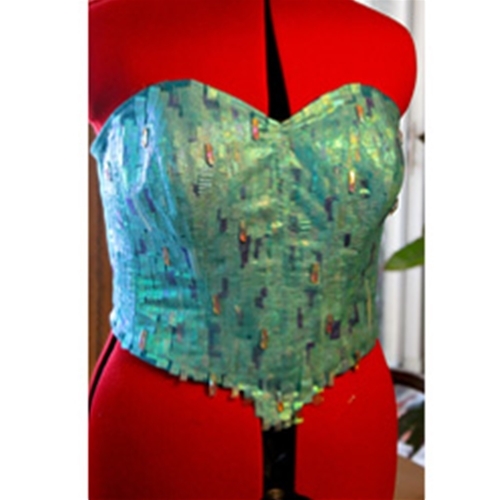 Kaz was inspired by the movie Frozen and recreated the bodice of Elsa's dress using our iridescent papers! Watch the light sparkle and bounce of the bright and festive colors of the Iridescent Papers. These fun papers bring the element of light to any paper project or creative design. 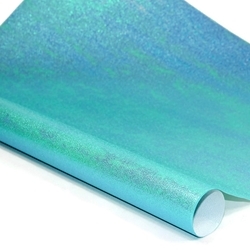 Ice blue hues shine and splash off this fun iridescent paper. Watch the paper come to life!